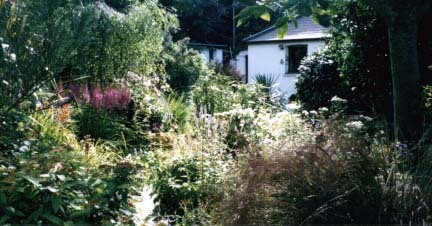 Two acres of organic garden only four minutes stroll from the bay. The garden is nestled in the valley and has a stream running through most of its length, allowing the creation of streamside and bog gardens. The wooded hillside on the south side merges imperceptibly with ferns, bamboos and other shade loving plants including the National Collection of Rodgersia which are at their best in June & July. As the woodland influence decreases where the valley opens out, there are informal areas of unusual herbaceous plants & grasses, with a backdrop of ornamental small trees and shrubs. There is also a large vegetable garden, and as with the ornamental garden, no chemicals are used. There are collecting boxes for the National Garden Scheme. The garden is open most days from May 1st to mid-September but wise to phone 01271 872409 between 7pm & 9pm to check.